From Thebes we traveled up the Nile to its source, and went on into Abyssinia, where we stayed for three months; and then coming out to the Red Sea we passed through, and finally reached the ruins of Babylon." This is the whole of the account that Mr. Gurdjieff gives of his and Professor Skridlov's trip to Abyssinia, modern day Ethiopia and Eritrea. One could be forgiven for not placing much importance on it. Compared to what Gurdjieff writes about his treks through the Hindu Kush in Meetings with Remarkable Men, his trip to Ethiopia would appear to have been uneventful. But could this be an instance where Gurdjieff buried the dog, that is, purposefully hid his sources? Said J.G. Bennett, "I do know that Ethiopia was very important to him because to the very end of his life he spoke with great love for Ethiopia. Once he said he thought of going to spend the rest of his days there. He said that the two places where he felt he had ties were one, Central Asia, that is, Bokhara, and the other is Ethiopia.... His visits to Ethiopia formed quite an important part of his total searches." Bennett seems to indicate multiple visits to Ethiopia occurred. Obviously Gurdjieff found something extremely valuable there. Was it a school? Gurdjieff once told Solita Solano that he was initiated into the Egyptian Mysteries four times. Did this occur in Ethiopia? Before investigating what Gurdjieff found in Ethiopia, the question of what caused him to go there in the first place should be addressed. What would have drawn Gurdjieff to Ethiopia? 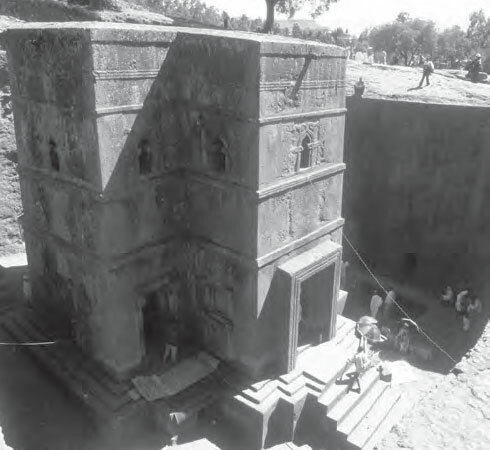 To this day most historians would argue that there is very little of cultural or historical importance in Ethiopia. In recent decades this Eurocentric view has begun to be refuted, but in Gurdjieff's time historians firmly believed that anything of value in Ethiopia was brought there by other people. This backwards view of Ethiopia persists even today and is best described by historian Amadou-Mahtar M'Bow, "In writing the history of a large part of Africa, the only sources used were from outside the continent, and the final product gave a picture not so much of the paths actually taken by the African peoples as of those that the authors thought they must have taken." Regardless of what his contemporaries thought, Gurdjieff would have found numerous indications of Ethiopia's actual historical role in his pursuit of ancient knowledge. Perhaps Gurdjieff went to Ethiopia in order to understand what drew Moses there. Moses married an Ethiopian queen and, according to the early Jewish historian Josephus, this happened on a military expedition in Ethiopia. But much more surprising is the Jewish oral tradition which states that Moses spent 40 years in Ethiopia. This only begins to make sense if we accept that Moses was between 120 and 140 years old when he died. Similarly, Mohammed married a woman whose dowry was provided by the king of Ethiopia. While there is no record of Mohammed going to Ethiopia, he was nursed by an Ethiopian woman, and Mohammed's maternal grandfather, who raised him, frequently traveled to Ethiopia. It is not too far of a reach to imagine Mohammed accompanying his grandfather on one of these trips, especially since Mohammed would later send a number of his family and followers to Ethiopia for refuge. It is also interesting to note that according to Plutarch when Set betrayed Osiris he was assisted by the Ethiopian queen Aso. Was Gurdjieff seeking the legendary Christian kingdom of Prester John that played such a role in the Grail myth, the legendary kingdom that Medieval Europe put such great hope in for assistance in the Crusades and the fight against the Mongols? Possibly Gurdjieff was researching an astrological clue. The constellations Cepheus and Cassiopeia, mythical king and queen of Ethiopia, circle around the pole star without ever dipping below the horizon. In addition to having such an exalted place in the heavens, the constellations of Andromeda, Perseus, Pegasus and Cetus all play supporting roles in these stellar myths of Ethiopia. What is it about Ethiopia that enshrined it so prominently in the stars? Perhaps Gurdjieff was trying to track down the Book of Enoch and the people who had preserved it. The Book of Enoch was lost to the world except for a few fragments in Greek. But in 1768 the Scottish Mason James Bruce traveled up the Nile into Ethiopia and stole an illuminated manuscript of the Book of Enoch from an Ethiopian monastery. It took over 50 years for the first translation to be published in 1821. Certainly Gurdjieff knew of the Book of Enoch and he must have had a general idea of its contents, but had he read it prior to traveling to Ethiopia? There is no indication that the book was translated into a language that Gurdjieff read, but recall that Gurdjieff's friend Abram Yelov was a master of languages and spoke English. In fact, Gurdjieff discusses his search for ancient books in Meetings with Remarkable Men. Gurdjieff met Yelov in a Tiflis book market where Yelov worked. But this was not just any book market. Recounts Gurdjieff, "I returned to Tiflis chiefly because I could obtain there any book I wanted. In this city, both then and the last time I stopped there, it was easy to find any rare book in any language, especially in Armenian, Georgian and Arabic." Certainly Enoch, the lost book of the Jews, set before the flood and describing the first human to perfect himself, must have been at the top of Gurdjieff's shopping list. Were Gurdjieff and Yelov able to get their hands on it or was Enoch the book that got away? As bizarre as it might first sound, is it possible Gurdjieff went to Ethiopia in search of the lost Ark of the Covenant? In addition to stealing the Book of Enoch, James Bruce also returned to Europe with a manuscript that told of how the Ark of the Covenant came to reside in Ethiopia during the time of Solomon. This myth had been uniformly relegated to the category of fantasy until Graham Hancock published the Sign and the Seal in 1992. In it he presents quite a compelling compendium of historical support for the myth. Did Gurdjieff give any consideration to a story of the Ark of the Covenant in a far off land? In his youth Gurdjieff shared our contemporary disdain for the historical merits of the tales of old. But he changed his mind after reading the Epic of Gilgamesh which had just been found inscribed in 4,000-year-old cuneiform tablets. Amazingly it was the same, almost word for word, as the poem his father had recited to him as a boy. He was shocked that this tale had been handed down generation to generation without change. Said Gurdjieff, "I often regretted having begun too late to give the legends of antiquity the immense significance that I now understand they really have." The newly exalted esteem with which Gurdjieff now held the ancient legends must surely have come at the expense of the modern discipline of history. Gurdjieff's regard for historians was evident when he wrote, "these historical data which I have just cited ... are the first, and I hope the last, that I have taken from information officially recognized on earth; that is to say, it is the first instance since the beginning of my writing activities in which I have had recourse to an encyclopedia." An extraordinary statement indeed, especially coming from a man who wrote weighty tomes on the history of mankind. James Bruce's manuscript about the Ark was almost completely overshadowed by the Enoch text. But it turns out that Gurdjieff most likely would have heard this legend of the Ark in Ethiopia from another source. The earliest known written version of this legend was by an Armenian priest. As strange as it may seem, Ethiopia and Armenia have had close relations since the time of Christ. Both countries trace the arrival of Christianity back to the decades after Christ's death and they both were early adopters of Christianity as a state religion. Both countries have maintained a constant presence in Jerusalem since the early days of Christianity, and it was primarily through their Jerusalem emissaries that relations were maintained. But there are also many accounts of Armenians in Ethiopia and Ethiopians in Armenia. One of the ties that bind the countries together is that they both share the Monophysite doctrine of Orthodoxy. Now, not only had Gurdjieff spent a good deal of time at the Armenian Theological Seminary but he also searched out and read as many ancient Armenian texts as he could get his hands on. In fact, his trip to Ethiopia was first set in motion while he and Pogossian were holed up in the ruins of the ancient Armenian capital of Ani. They had gone there to find a quiet place to read the ancient Armenian texts they had collected. It was there in the ruins where they uncovered a letter that gave the location of the Sarmoung Brotherhood. But as you will recall, their trip to find the Sarmoung was abandoned when Gurdjieff made a copy of a map of pre-sand Egypt from an Armenian priest whose family had owned the map for as long as the priest could remember. 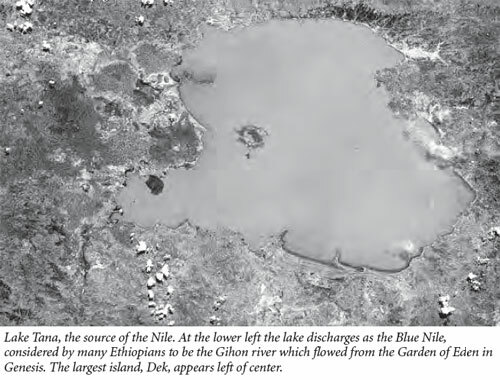 Did that map show something at the source of the Nile, in Ethiopia? Now having established that Gurdjieff's trip to Ethiopia was anything but a whim, we can attempt to address the issue of what Gurdjieff found there. Of course, the ultimate question, did Gurdjieff find an esoteric school of the highest level, can only be answered with absolute certainty by Gurdjieff himself. Unfortunately, in the one sentence about his trip to Ethiopia in Meetings with Remarkable Men, he doesn't say. After a long arduous trip through the deserts of Sudan, Gurdjieff would have arrived at the source of the Nile, Lake Tana. Dotting the lake are small islands, 20 of which house Christian monasteries; one supposedly housed the Ark of the Covenant for 800 years. Here on an island, or nearby on shore, Gurdjieff would have entered an Ethiopian church unlike any Christian church he had been in before. Many of the churches of Lake Tana are circular buildings divided into three concentric rings, with three doors aligned to the east, north and south. The outermost ring is the Quene Mahlet where services are performed for the laity, men on the left, women on the right. The middle ring is the Qeddist, reserved for priests performing various duties and where the laity who feel pure, having fasted and conducted themselves blamelessly, receive communion. The innermost part of the church is the Maqdas, or the Holy of Holies. Accessible only to priests and deacons, this is where a replica of the Ark of the Covenant called the Tabot is kept. The square sanctuary stands clear in the center, the arrangements based on Jewish tradition. Like the rest of Christendom, Ethiopian churches are consecrated; but only the installed Tabot, separately consecrated, gives it sanctity. Can this church design be an architectural representation of the three circles of esotericism? One church in Ethiopia does not have a Tabot in its Holy of Holies. The church of St. Mary of Zion in the ancient city of Axum is said to house the actual Ark of the Covenant. Once a year the Ark is removed from the church for the procession of the festival of Timkat. In order to protect the laity it is wrapped in a special cloth. If Gurdjieff was present for this festival he would have noticed quite a similarity with the Apet festival depicted on the walls of the Egyptian Temple of Luxor. In 1990 Graham Hancock made the following observation at Luxor, "It was barely three months since I had attended Timkat.... The details of the ceremonials that I had witnessed during those two days of religious frenzy were therefore still fresh in my mind so fresh in fact that I could hardly fail to note the similarities between them and the ecstatic procession portrayed on the time-worn stones of this Egyptian temple. Both events, I realized, focused around a kind of 'Ark worship,' with the Arks being borne aloft by groups of priests and adored by hysterical crowds. Nor was this all: Timkat had been characterized by the performance of wild dances and the playing of musical instruments before the Arks. This sort of behavior it was now clear, had also been an intrinsic part of the Apet festival, right down to the types of musical instruments used." Years later in New York City, A.R. Orage would tell C.S. Nott that, "Among the early Christians dancing in churches was an important part of the ritual." It was in Ethiopia that Gurdjieff saw Christians dancing in church. 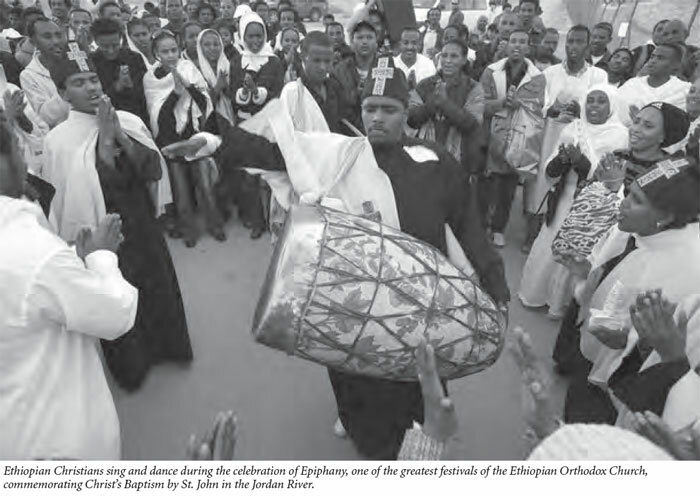 From undulations of the upper torso during the liturgy, to more elaborate dances performed outdoors, to the dances of the priests outside of the holy of the holies, Ethiopian Christians dance. Gurdjieff, who frequently referred to himself as a teacher of dancing, must have been enthralled. A study of these traditional Christian dances by someone with extensive knowledge of Gurdjieff's movements may provide new insights into this aspect of his teaching. Ethiopia also has a rich canon of sacred Christian music that, according to tradition, was given to the Ethiopian St. Yared by angels. St. Yared developed one of the oldest music notation systems in the world. One of the popular types of hymns, the Malke'a or Likeness, is most interesting. Beginning with the first stanza it describes and praises a saint's hair and then stanza by stanza it proceeds from one part of the saints body to the next, finally ending with the toes and toenails. The thought of a Christian congregation focusing on a succession of body parts, even those of a saint, was so disturbing to one European theologian that he concluded that it was "not a very elevating type of Christian poem." From what little of the Ethiopian sacred music I have heard, it has a resemblance to some of Gurdjieff's harmonium recordings. Again this seems an unexplored area of research that may prove fruitful. 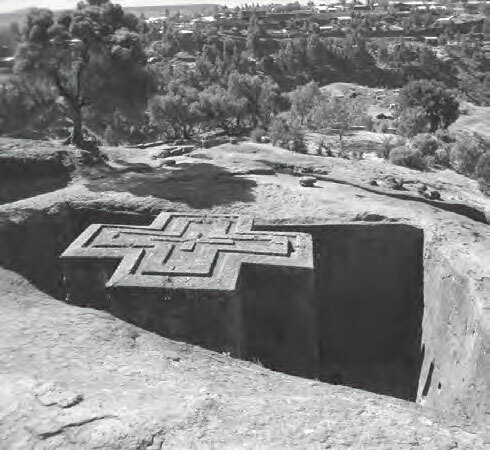 Having witnessed the unique practice of Christianity in Ethiopia and noticed some connections to Egypt, Gurdjieff must surely have tried to find out as much as possible about the history of Ethiopia. In Beelzebub's Tales Gurdjieff provides us with clues about what he found. One clue is that after the sinking of Atlantis, the surviving members of the Society of Akhaldan went to the source of the Nile prior to settling in Egypt. This would seem to indicate that Gurdjieff found evidence of a very old culture in Ethiopia. Probably the oldest man-made structures in Ethiopia are the dolmens that dot the countryside. According to Gurdjieff dolmans were used for navigation and served as sign posts that led to centers of initiation. On his trek through the Caucasus with the de Hartmanns and the Stjoernvals, a group of local hunters showed Gurdjieff what they thought was a solitary dolmen. Imagine the shock of these men, who had hunted this land since they where children, when Gurdjieff was able to calculate the location of two additional dolmens. Would Gurdjieff have been able to find ancient sites in Ethiopia through his ability to navigate via dolmens? When Gurdjieff went to the caves of Lascaux shortly before the end of his life, he told Bennett that there should be seven dolmens surrounding the cave within a circumference of five kilometers. How did he know this? Also he was certain the paintings are 8,000 years old. And most astonishingly, when Bennett asked him about some of the signs on the cave walls Gurdjieff replied that they were letters like the Chinese and that this script comprised 45 letters in all. In fact, Gurdjieff's reaction to Lascaux is that of a man who has spent a considerable amount of time studying similar caves somewhere else. There are a number of known cave art sites in Ethiopia and Eretria, but due to political instability and fighting there have been long periods when no archeological work could be done. As an indication of the amount of cave art in Ethiopia, two single, monthlong expeditions of the Tigrai foothills resulted in 41 sites containing rock shelters, many of which contained rock art. The most exciting find of the expedition was "a cave which contains both engravings and paintings. The cave is reported to extend for many kilometers in the mountain but at present is blocked (at 14.4 m) by artificial stone piles supposedly to protect ovicaprids [sheep] from entering deeper into the cave." Of course there are many places on Earth that have both dolmens and cave art, but for some reason Gurdjieff chose Ethiopia as the spot where post-Atlantian human history began. In his book Child of Atlantis: A Radical Interpretation of the Origins of Civilization John Gordon expresses the view that esoteric teaching is structured differently for different astrological ages. For example, Christianity was a necessary form of esotericism in the Piscean age. This is a view shared by R.A. Schwaller de Lubicz, Maurice Nicoll and others. According to Gordon, the age of Cancercommencing about 8,740 bcewas associated with the Underworld. Gordon dates the Egyptian Book of the Dead to this time period and states that esoteric teaching and rituals would have taken place in caves. This dating would be in accord with Gurdjieff's dating of Lascaux, a dating with which archeologists disagree. According to Gordon, the next age, Gemini, would have centered on sacred groves of trees. Sacred groves played an important part in the early formation of many cultures, the most famous of which is the oak grove of Dodona, the oldest Hellenistic oracle. In Ethiopia Gurdjieff would have encountered the Qemant people who still worship in sacred groves. The Qemant are often referred to as "Pagan-Hebraic," due to the fact that they practice similar dietary restrictions as the Jewish people. Worship is conducted outdoors, usually at a site near a sacred tree (called qole), wrapped in variously colored strips of cloth. This appears to be a survival of a biblical tradition: "Abraham planted a grove in Beersheba, and called there the name of God" (Genesis 21:33), and, "where the women wove hangings for the grove" (II Kings 23:7). The Qemant trace their lineage back to Noah and state that they lived in Cannan with Abraham's tribe. Both tribes left Cannan during a famine. A marriage was proposed between the tribes but it did not occur. The Qemant people would have been living in Ethiopia when Moses visited, possibly the Ethiopian wife he took was Qemant. Interestingly, the Egyptian Pyramid Texts, some of the oldest writings of the Egyptians, contain three texts of ascension that mention "Sopd who is under his ksbt-trees." This Sopd would appear to reside at the top of the Nile. Utterance 480 is the most detailed of the three; in it the Nile is compared to a ladder upon which the soul of the king ascends, upstream. "The Mounds of Horus, the Mounds of Seth, the Field of Rushes, they worship this King as Dwew, as Iehs who presides over Upper Egypt, as Ddwn who presides over Nubia [present day Sudan], as Sopd who is under his ksbt-trees [after Upper Egypt and Sudan comes Ethiopia]. They raise the ladder for the King." The king's climb does not stop there though, "The King ascends upon the thighs of Isis, the King climbs upon the thighs of Nephthys, the King's father Atum grasps the King's hand and sets the King at the head of yonder gods who are excellent, wise, and imperishable."